Paul Bakery and patisserie is a family run business which started in France and now has shops all around the world. I was invited to a bread making masterclass with a Valentine theme which really appealed to me for a few reasons. Firstly, I always wanted to attend a bread making course but I never got the chance. 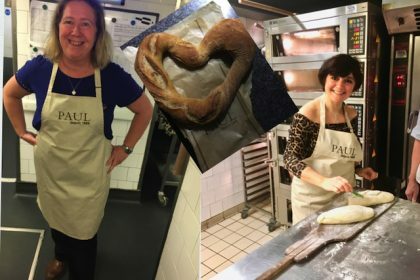 Secondly, when I was offered the opportunity to attend a masterclass in a renowned bakery, I could not let this opportunity go by as I have to admit that I love Paul’s bread loafs. Therefore having the chance to make my own baguette or olive loaf, was the most tempting venture I could have asked for. Situated amidst the London West End theatres is The Delaunay, a stunning all day café and restaurant which can be found just off the Aldwych. 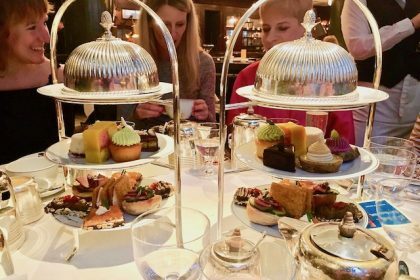 One of the reasons to visit The Delaunay is their afternoon tea which is served seven days a week between 3 and 6pm. Once you enter the main building, there is a very nice receptionist that welcomes you and leads you to your table. The café restaurant area is quite vast and it seems inspired by the European Grand Café appearances, which makes it seem rather majestic. Last weekend I was invited to the London Shuffle Club in Shoreditch for what I can describe as an amazing time and event. Upon arrival I was greeted by two lovely staff members who led me inside the venue to sit at a table to enjoy two full hours of blissful pizza brunch & Prosecco. 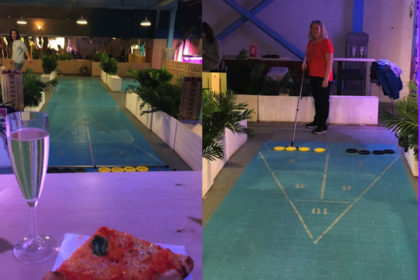 During this time I also had a chance to learn about and have a go at shuffleboard, a game of which I knew nothing before stepping into London Shuffle Club. I can now confidently say that not only I know what shuffleboard is but also how it works!